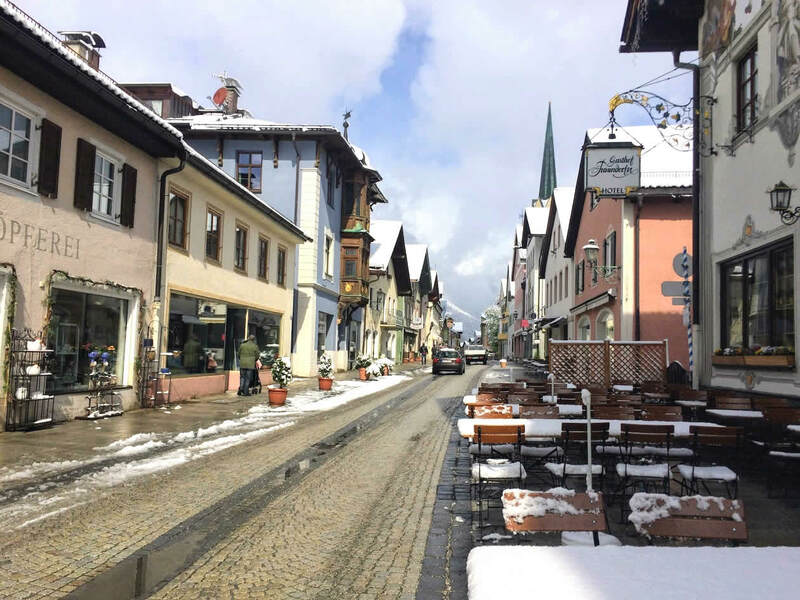 Last Easter I’ve spent five days in Garmisch-Partenkirchen, a small German town, located in a middle of the Alps. 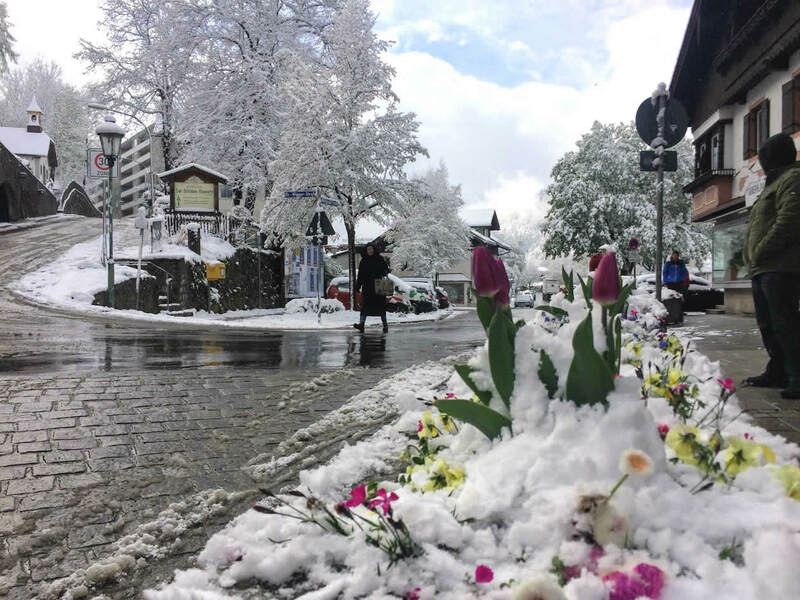 And although it was way in the second half of April, we had a proper winter holidays filled with mountaineering, Bavarian cuisine, snow and some more snow. 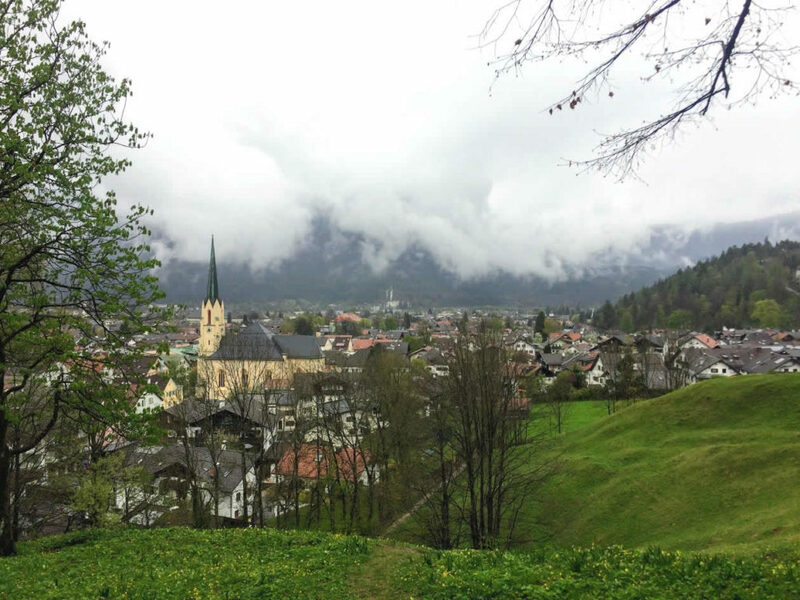 So, here is my short guide of what to see in Garmisch-Partenkirchen. 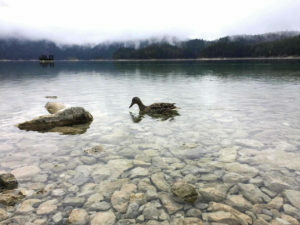 The best way to get to Garmisch-Partenkirchen is to fly to Munich or Innsbruck Airport and take a car to Garmisch- Partenkirchen then. It took us around an hour to get there from Munich. There was a highway all the way from airport till our destination so it was very easy to navigate our way. 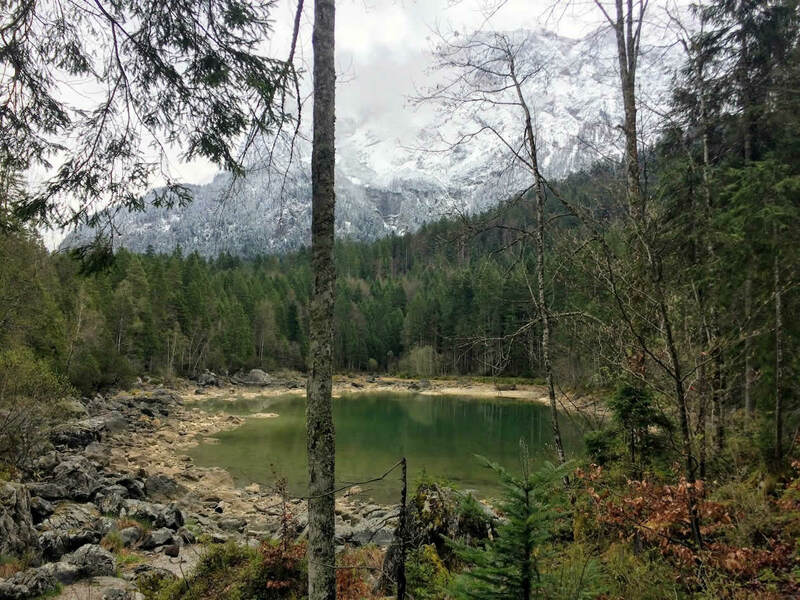 It was interesting to see the landscape changing from valleys around Munich towards more of a mountains when we were closer to Garmisch-Partenkirchen. There is a train station in a town as well, so the other option could be to fly to Munich or Innsbruck and take a train from there. 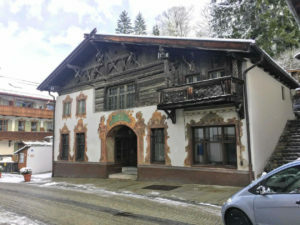 Garmisch-Partenkirchen is well known skiing and winter destination, so it shouldn’t be a problem to find a place to stay. 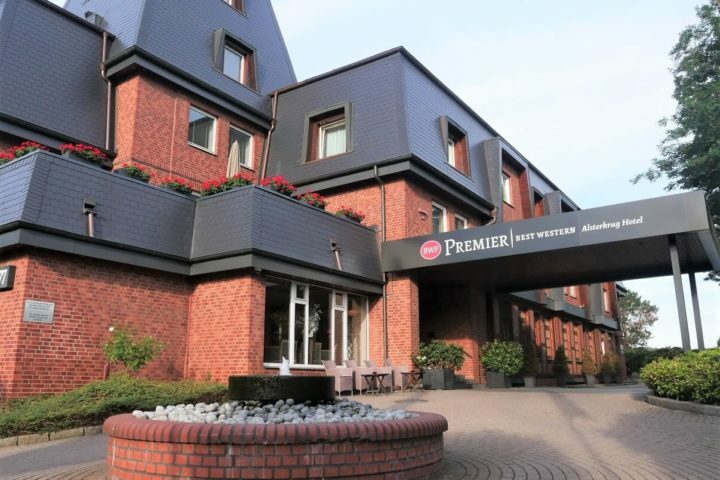 I’m always using Booking.com because they have the widest range of accommodations on their website and you should definitely find something for yourself. Our hotel was one of those nice resorts with a lot of activities, like spa, children playground and a great restaurant. It was a perfect fit for us, because we were there with our 2.5 year old son. Garmisch-Partenkirchen’s history goes way back to the Roman times, but it was very important in the Middle Ages as well. It suffered from the plague epidemics then and occasional witch hunts. 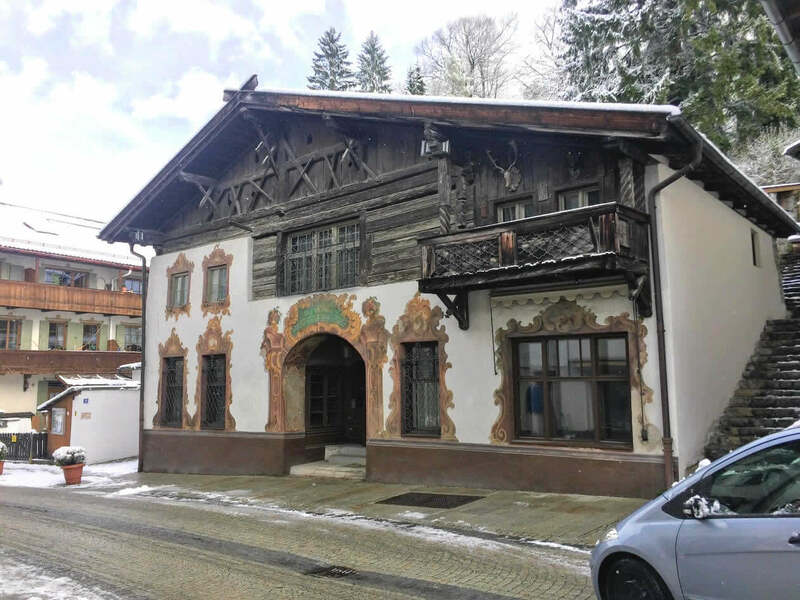 It’s interesting that Garmisch and Partenkirchen were two independent towns until the Olimpic Games in 1936 when Adolf Hitler forced their majors to unite in a single town. Quite a history, ha? 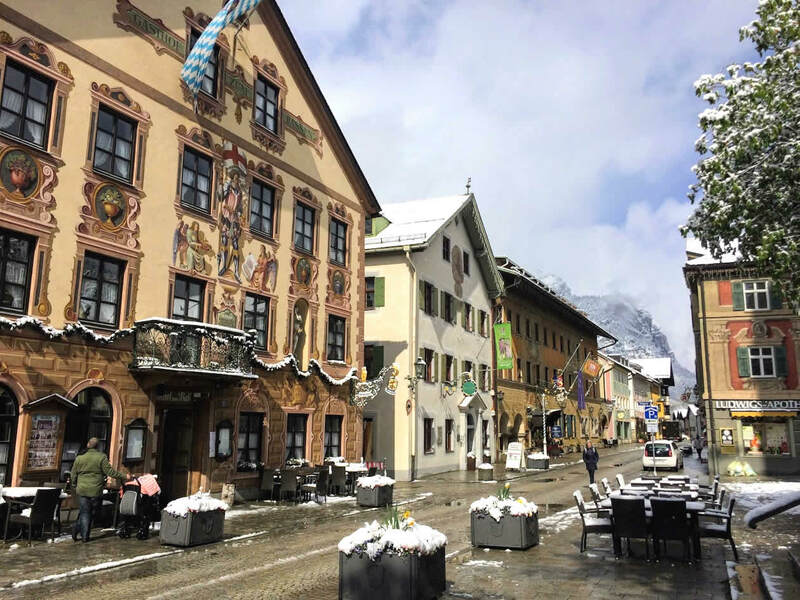 Garmisch-Paterkirchen is a perfect combination of a beautiful nature and an interesting history and culture. 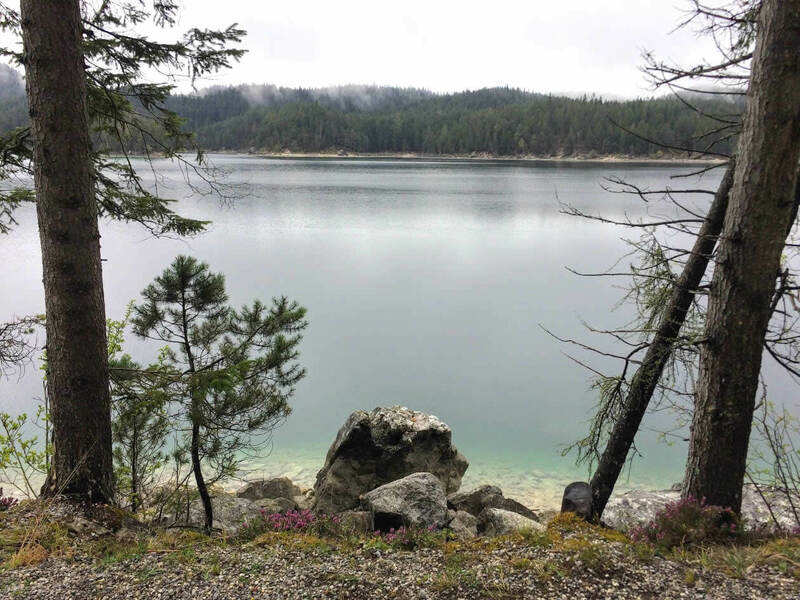 It’s also quite close to some nice places, so if you’ll be there with a car, be sure to go on a trips outside the town, as well. 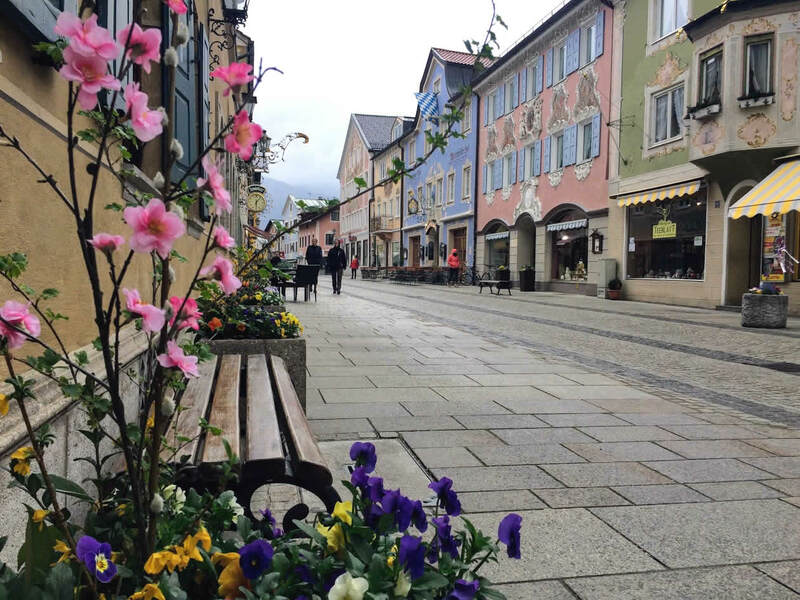 Garmisch-Paterkirchen is located in a heart of Bavaria, a region on a very south of Germany, close to the border with Austria. 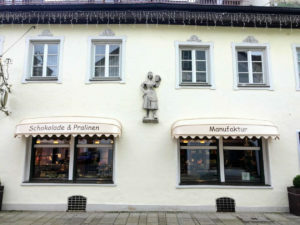 It’s known for its beers, pretzels and dirndl dresses. It’s my favourite part of Germany because it’s so picturesque. It should be a definition of a peaceful countryside! 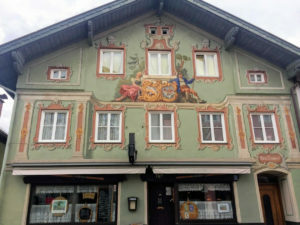 And I’ve never seen so many painted facades like in Garmisch-Partenkirchen. 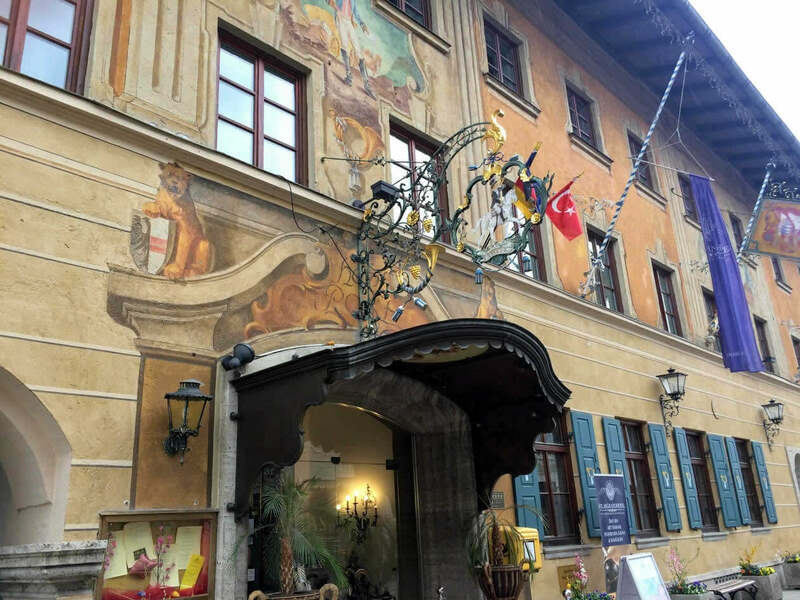 Almost every single house had facade painted in a different colour and had some image on it (mostly religious ones). It really looks like a town from a fairytale. 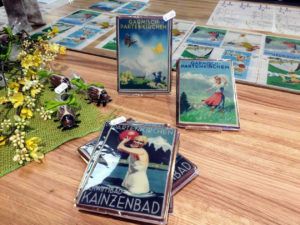 *TOP TIP: Try to ‘read’ German history on some of the images. The interesting one to me was the one with a slave on it. 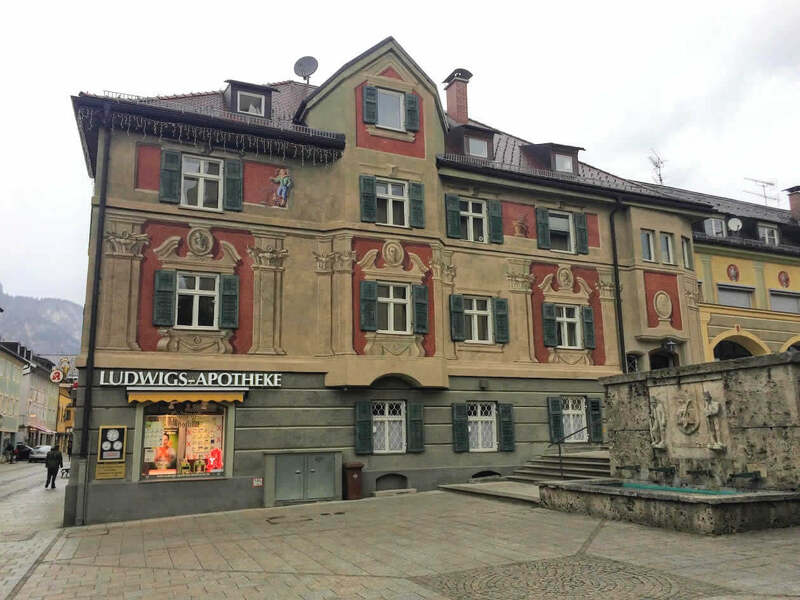 There is a museum in a town center dedicated to the history of Bavaria. It’s located in the old town house from the 17th century and it’s nice to see one of it’s typical houses from the inside. I’ve found kitchen and its black walls to be especially interesting. Beside it, paintings showing the area, mountains and a life in Alps were the most interesting to me. Just a few houses further is another nice place – a chocolate store. 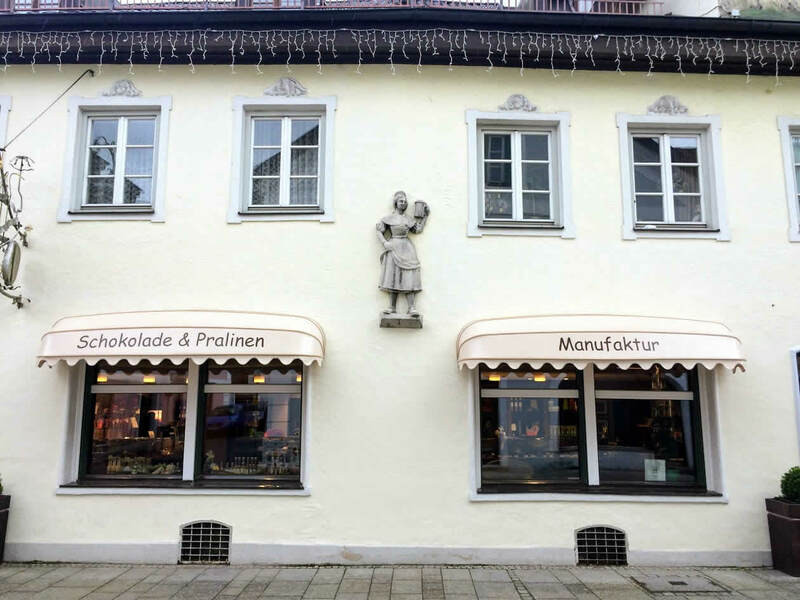 There is a little chocolate factory there where you can actually watch how the chocolate is prepared. And then you can just get lost among the all beautiful pralines and different chocolate flavours they have. Many of them have vintage pictures of Olympic Games on it, so I believe you shouldn’t look for souvenirs anywhere further. 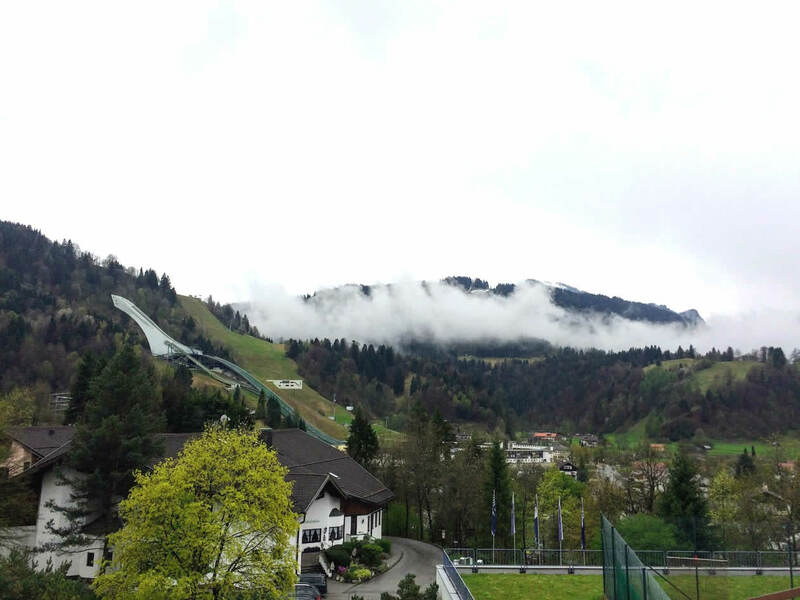 Definitely an important place in Garmisch-Partenkirchen is a sport center built for the Olympic Games in 1936. Its most interesting part is a ski jumping ramp where you can watch ski jumping (if you’ll visit in a winter months of course). It’s a great place for skiing, or, if you are like me visiting in spring, walking and hiking. *TOP TIP: There is a nice cozy coffee shop beneath the ski jumping ramp with some delicious cakes. There are so many walking paths in Garmisch-Partenkirchen that you can’t get bored with them. It’s a real heaven for hiking! We chose the one closest to our hotel and went to the panoramic walk around the town. There were some really beautiful views on our way. I haven’t been hiking in the rain for a few years, so this just reminded me how beautiful it could be. Well, yeah, I’m missing the mountains! Around 20 minutes walk away from the Olympic Centre is one of the most stunning places in Bavarian Alps – the Partnachklamm. 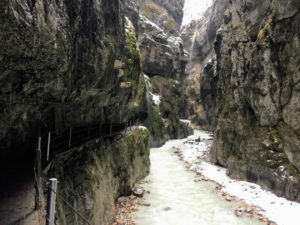 It’s a path through the mountains, on which you’re walking through caves and tunnels and is really impressive. 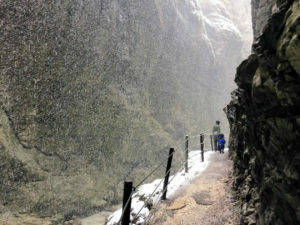 When we got there it just started to snow, but the snow was getting stronger and stronger and eventually become blizzard. 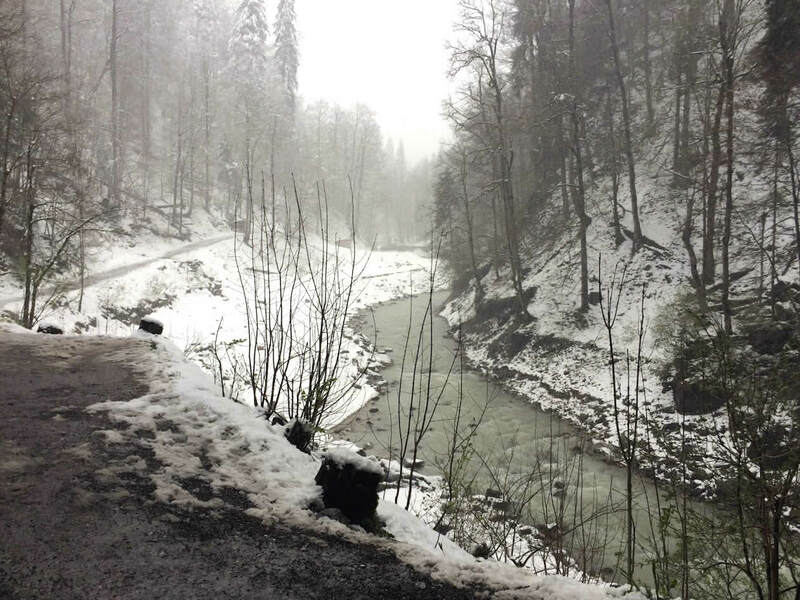 It was great to see such a wild nature and such a quick change of a weather. It was absolutely a stunning place! This was my first proper holiday in Alps, so we wanted to see some of its famous sceneries. 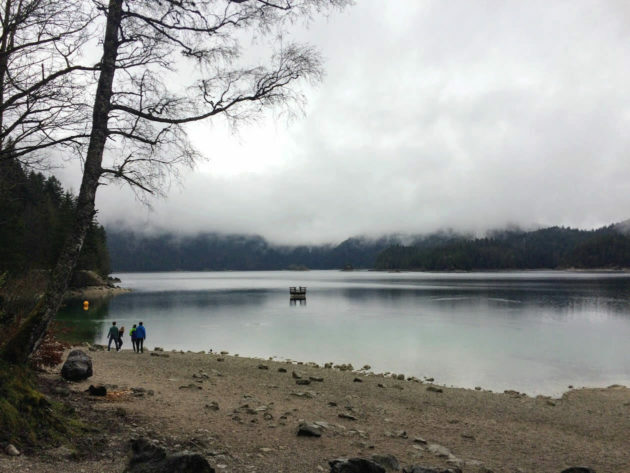 The receptionist in our hotel told us about Eibsee Lake, a beautiful place with a water so clean it was almost transparent and surrounded with mountains. We walked around the lake and ended up having a lunch in the restaurant on it. You know those moments you’ll remember forever? 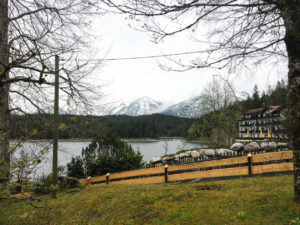 Well, it was definitely one of them, having a delicious traditional Bavarian lunch while enjoying a stunning view on a lake and a huge Alps covered with snow in a distance. 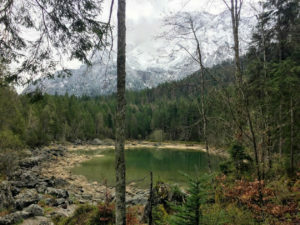 Very close to the Eibsee lake is the highest peek of German Alps, the Zugspitze, so you can visit both places in one day. You can get there by the cable car and enjoy some of the beautiful views from its top. 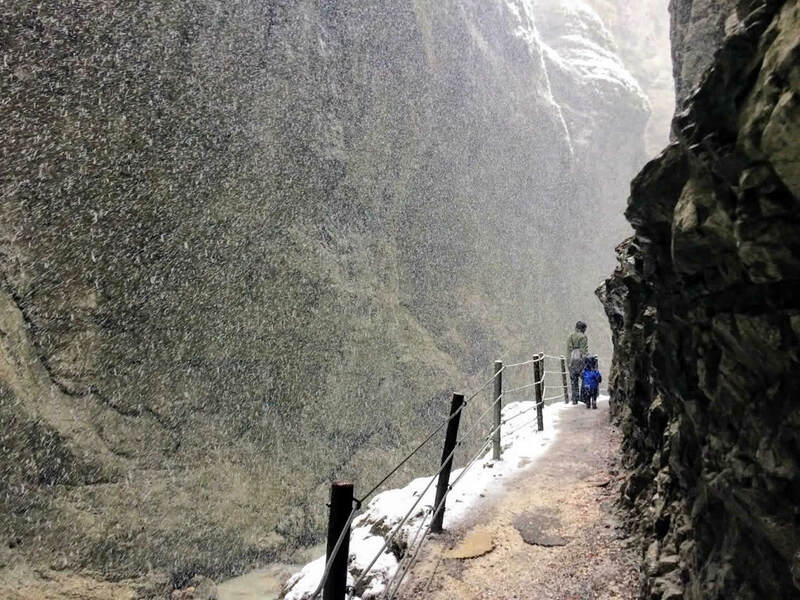 One of the most famous German castles is just an hour away with a car from Garmisch-Partenkirchen. However, I’ve missed it for the second time. We just didn’t had enough time at the end to visit it. Well, it is just an excuse to come back! 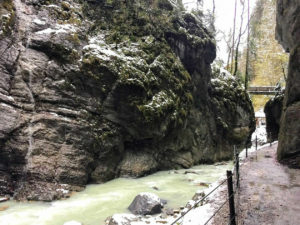 After five days I’ve spent in Garmisch-Partenkirchen it was time to go home. While we were driving towards the Munich, landscape (and amount of snow) were changing rapidly again. Once there, winter fairytale in which we spent the last few days looked so distant. We had that great feeling one have after a few really relaxing days and holidays you will definitely remember. Not even the fact we’ve forgot one of our bags in a hotel (and actually never got it back) could spoil that feeling. We have liked it so much that we’ve decided this will become our new family tradition: we are going to spend our Easter holidays in the Alps from now on! Have you been in Garmisch-Paterkirchen? What were your favourite places there? Let us know in the comments below! You will definitely love it then 🙂 The nature is just amazing!